Posted on Tue, Apr 3, 2012 : 10:09 a.m.
A portion of the Hudson Mills Metropark golf course is set to reopen April 9; three weeks after a tornado tore through Dexter and damaged the course. The tornado littered the golf course with debris, including toys, a lawnmower, pieces of roofing and high school papers. In some parts of the course, branches were stuck in the sod like spears thrust in the ground. Because the most significant damage occurred in the area of holes 13 and 14, only the front nine holes of the course will reopen April 9, the Dexter Leader reports. 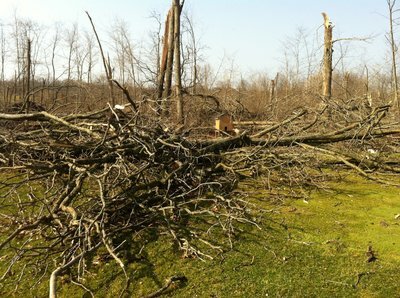 Metropark crews removed more than 150 downed trees from the front nine holes, including thousands of sticks and twigs. Hudson Mills’ main park, which is located across the street from the golf course on North Territorial Road, is open and did not sustain much damage from the tornado. To read the full Dexter Leader report click here. is dexter pinckney road open to thru traffic? Thu, Apr 5, 2012 : 12:58 p.m.
thank you for the quick reply. that is wonderful news. Tue, Apr 3, 2012 : 3:02 p.m. I don't know where your getting your info,but the main park is located across the RIVER,not across the street from the golf course. Across the street are houses or whats left of them. Tue, Apr 3, 2012 : 2:58 p.m. I was planning on playing at Hudson Mills the saturday of the week of the tornado, but mother nature had other plans. Btw holes 13 and 14 are the back to back par fives that go through the trees there if anyone is wondering.